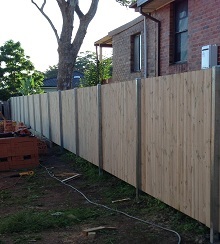 Angelo’s Local Fencing has supplied Australia’s largest city with quality Colorbond fences for over a decade. We pride ourselves on our excellent service, in-depth knowledge and low prices. Our friendly team comes fully trained, ensuring your Sydney fences are a result you can be proud of. Whether you want to surround your home or simply your backyard pool, we have plenty of Sydney fencing solutions that are sturdy, safe and eye-catching. Due to its high quality and flexibility, we use Bluescope steel when it comes to creating tailor-made Sydney fences and outdoor solutions. This material comes in a range of colours and heights, ensuring you can pick a design that suits your needs perfectly. Those seeking wooden fences in Sydney for their pool or garden can also find plenty of timber solutions here at Angelo’s. In this way, you can mix and match as you desire even switching the posts and rails if need be! Our fences for Sydney-wide customers are guaranteed to be both robust and durable, remaining in excellent condition for lengthy periods of time. If you seek outstanding attention to detail when erecting these essential home additions, Angelo’s is a smart choice. 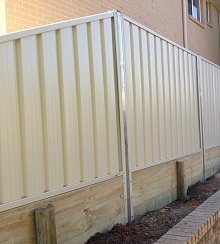 Those who want more information or advice on fencing in Sydney can get in touch with our team. 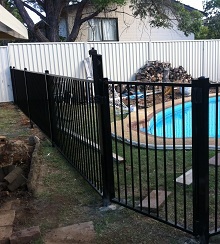 Discuss Colorbond fencing for pools, gardens and more by phoning 0423 337 007 or filling in the form to the right. We are more than happy to talk with you! We have striven to differentiate ourselves from our competitors in many different ways including providing a superior level of service. Since we rely on word of mouth advertising, it is essential that we satisfy each and every one of our clients as best as we can. At Angelo’s Local Fencing, we deliver a positive experience every step along the way.